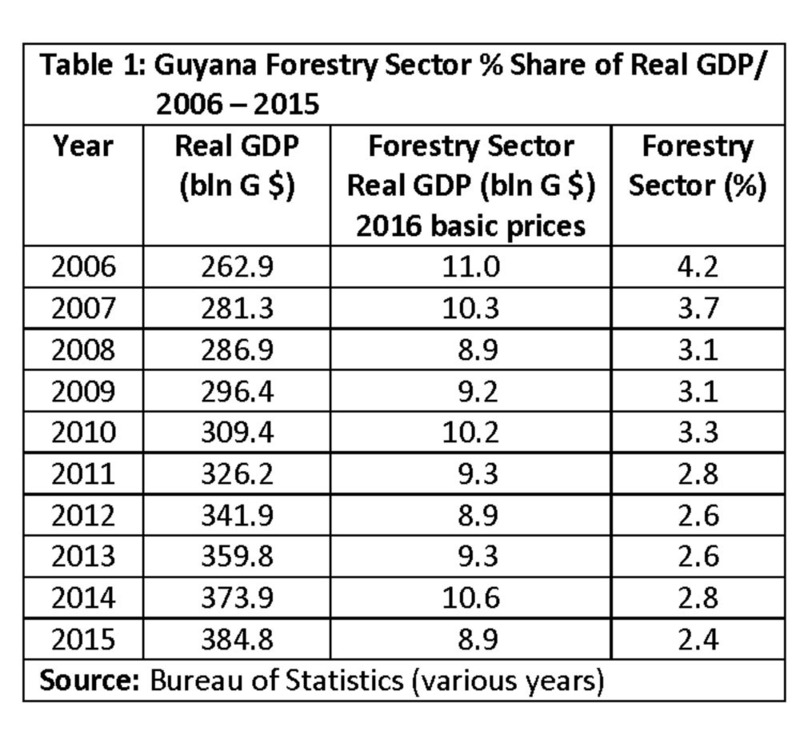 Last week’s column highlighted what I consider to be a most distinctive feature of the extractive forest sub-sector’s performance in Guyana’s economy, during the past decade. The table that was presented there revealed the highly erratic annual contributions of the sub-sector to GDP. Thus, while GDP growth had averaged 4 per cent per annum over the past decade, the annual contributions of the forest sub-sector to this performance was quite inconsistent (ranging by more than one-third in the space of three years, from plus 20 per cent in 2006 to minus 13.6 per cent in 2008). Similarly, large swings also occurred during 2014-15. 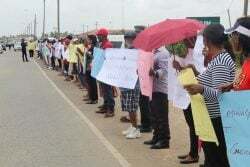 The actual circumstances are, however, far more impactful, since not only has the sub-sector’s contribution been erratic, but its overall performance has been woefully weak, and declining. Table 1 below shows that, over the decade, the annual percentage share of the sub-sector in GDP (in real terms), has been declining. 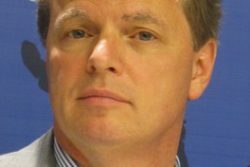 Indeed, the mean contribution of the sub-sector to real GDP has averaged just about 3.5 per cent during the first half of the decade, falling to 2.6 per cent in the second half – a decline of about one-quarter. The average over the entire decade has also been modest – about 3.1 per cent. 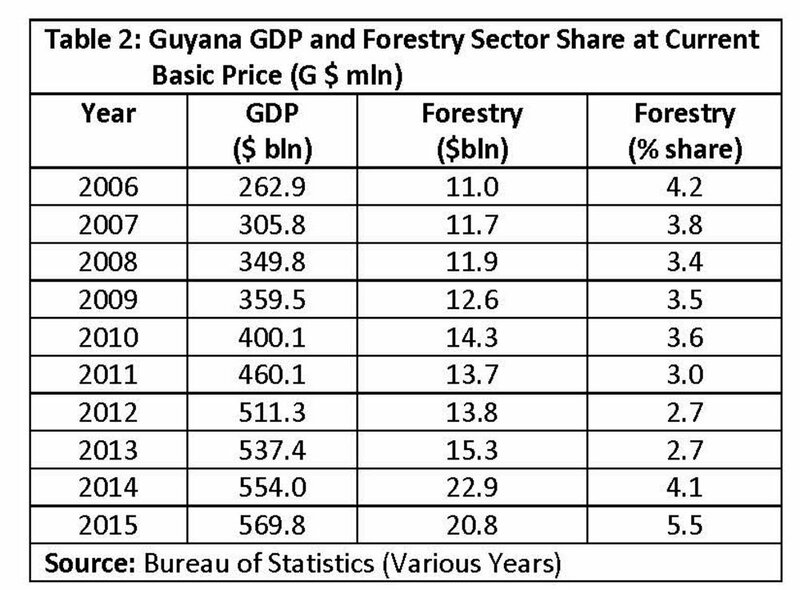 When Guyana’s GDP data are presented in nominal terms (that is at current prices), the performance of the forest sub-sector improves (see Table 2). Here it averages 3.7 per cent of total GDP over the decade, and 3.7 per cent over the periods 2006-2010 and 2011-2015. While both shares remain the same; it has fluctuated between a low of 2.7 per cent in 2013 to a high of 5.5 per cent in 2015. (The comparable figures for real GDP are a low of 2.4 per cent in 2015 and a high of 4.2 per cent in 2006.) 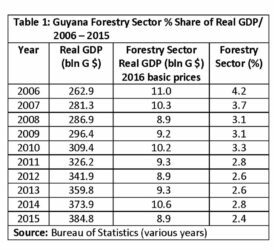 For readers’ information, the GDP data are sourced from the Guyana Bureau of Statistics, which as I indicated last week, bases its calculations on data provided by the Guyana Forestry Commission. Over the past several decades the Government of Guyana, independent consultants, NGOs, and academic researchers have reviewed Guyana’s extractive forest sub-sector at considerable length, identifying several major constraints. In this Section, I begin a review of some of these contributions. 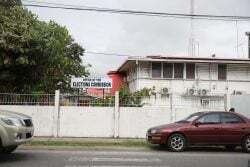 Like the mineral extractive sector, forestry (Guyana’s overall leading non-mineral extractive sub-sector), has been around for centuries, having followed directly on European colonization and settlement of the country. From the earliest periods rudimentary sawmill operators, loggers (particularly greenheart and firewood) and non-timber producers (particularly balata and wild-life) were engaged in simple trade in the export and domestic sectors. In those days the production and distribution systems for forest products were highly irregular. To address this, in 1925 the British Guiana Forest Department was established by the Colonial Authorities. 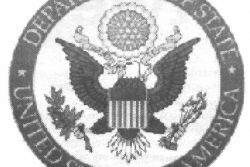 At the time, the highest valued forest products were “hewn squares, piles, and large sawn baulks” (National Development Strategy for Guyana, NDS, (Version 1) 1996). The Forest Department adopted at least three major tasks. One was to improve the export and domestic marketing of Guyana’s timber. (This meant greater attention being paid to the quantity and quality of traded timber products.) The second was to promote a widening of the range of traded species of wood in both markets. And, third, to secure the consolidation of the market for Guyana’s most well-known species (greenheart). Shrewdly, the 1996 NDS had observed back then that these tasks, as prioritized by the Forest Department, were longstanding ones, which underscore the intractable nature of the problems confronting the forest sub-sector. Regretfully, the earliest contributions to the literature identified policy changes that are still being prioritized today. Thus, bans were urged on selective logging of a few species; and, the “filling of specific orders” from overseas purchasers. These practices not only led to poor extraction logistics, but reinforced the poor marketing potential of other lesser known species. “Cutting of trees to order” clearly undermined the exploitation of balata and other related non-timber forest products, while dis-incentivizing the sustainable development of the lesser known species. While today’s structure of the extractive forest sub-sector is largely a product of these historical legacies; it is also a response to recent global developments in 1) commodity product trading 2) globalisation of investment and finance 3) commodification of nature (the sale and purchase of environmental services) and 4) the “monetization” of natural resources into tradeable/marketable forms of so-called “natural capital”. It is evident from the above that the forest sub-sector’s contribution to economic growth has been woefully erratic, weak and declining. 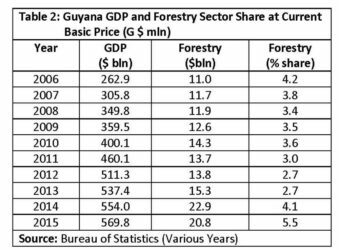 There have been quite poor returns for the high standing of Guyana’s forests in its natural resource endowment. Next week I plan to introduce a discussion of some of the issues highlighted above, but will leave their fuller amplification until after completing the positioning of the extractive forest sub-sector in Guyana’s economy, especially in terms of employment, trade, and the production of its key products.